Fans of the Maze Runner series were forced to wait quite some time for the conclusion to the series due to an unfortunate accident during filming, but will find The Death Cure to be a rewarding end to the journey. The Death Cure has plenty of action, drama, and tears that will take audiences on a roller coaster for the final showdown with Wicked. This is all aided by an excellent soundtrack by John Paesano who we may also know now due to Daredevil and The Defenders on Netflix. Like most dystopian series movies, the last arc is when the heroes go into the belly of the beast and all hell breaks loose. It brought back many memories of Hunger Games: Mockingjay Part 2 for me, although the heroes and villains don’t seem to be as collected in the Maze Runner as they were in earlier movies and this movie is pure chaos from a storytelling perspective. It would be better not to try to think too hard or obvious plot holes exist. Despite the lack of a completely fluid world, the characters in this film do develop and I found myself more attached to them as the series came to an end and their stories concluded, which is a credit to the acting in this film. Mutual suffering creating brotherhood and solidarity is present throughout this film as a powerful theme and I found myself moved by that. My only complaint is that we didn’t get more dialogue of Ki Hong Lee as Minho in this film. That’s partly due to the plot. On the other hand, Kaya Scodelario really delivered as Teresa and for the first time I connected with her acting compared to the prior two movies. Thomas Brodie-Sangster as Newt actually took up a large part of the film and I think this was an ode back to the book. Dylan O’Brien seemed different in this film compared to others in playing Thomas and as a darker film with more on the line than ever, he delivered quite well. The obvious aging due to the delay of the release of the film may have also helped give him a more mature and serious look that aided his performance. The cinematography is beautiful and feels like a cross between The Hunger Games and a stripped down Blade Runner: 2049. A truly dark, sci-fi kind of world. Overall, The Death Cure is a well-deserved conclusion to the series for fans. It has just enough to let a casual audience ride it through, but is more fulfilling to audiences already attached to the characters who can understand the struggles they have survived. It is worth a visit to the theater. Star Wars: The Last Jedi was one of my most anticipated films of 2017. There were numerous unexpected great films this year though and in the end Star Wars: The Last Jedi was good, but not great. During my first viewing of the film, I was overwhelmed with all the things happening. The Last Jedi had multiple intertwining plots that ironically ended up taking us nowhere by the end. A second-viewing providing more clarity and focus to me. Let’s start off with the good: Kylo Ren. When I saw The Force Awakens in 2015, I was unimpressed with Kylo Ren. He was that typical Disney Channel star. Completely whiny. Annoying. Lacks depth. We knew he was “conflicted”, but without clarifications from Abrams – it wasn’t clear why this kid was throwing tantrums every 5 minutes and why any of it should matter to the audience. The Darth Vader wannabe. The Last Jedi developed Kylo Ren better. This film humanizes Kylo Ren. When he hesitates to kill his mother. When you realize he is really lonely and feels abandoned by his family. When he suggests that he wants to run away from who he is to be someone else. Those are things people can relate to much more than just crying all the time about your daddy issues that nobody wants to hear. He is still terrible, but at least now you can understand why. Rey wants to believe in Kylo Ren switching sides and by the time you get to their epic fight scene with Snoke and his bodyguards, some part of you wants to believe Kylo Ren too. It takes acting skill to be able to mislead an audience in that kind of way. I wanted to believe. Then he throws away all your hope puts it in a trash can. That’s actually a good metaphor for The Last Jedi. The Last Jedi takes all your expectations for a Star Wars sequel and throws them all away. The entire legacy and history literally goes up in flames. Rian Johnson brought back Yoda in a play to get fans to let the past go and move on from the Star Wars they once knew. Star Wars without Jedi isn’t Star Wars though. People go to the movies to watch lightsaber battles. They love the Skywalker family. They have poured billions of dollars of support into it. Would you really pay to go see a movie without them? Disney is testing the field for this in The Last Jedi and it was divisive as evidenced by the abysmal Rotten Tomatoes Audience Score that is miraculously now worse than the prequels. There is nothing worse than having a creator disrespect something you love and if watching Han Solo die in The Force Awakens was difficult, The Last Jedi turns the dial to 100. Luke Skywalker further exemplifies this wish to exit the history and legacy of Star Wars. Luke like his father Anakin were the basis for all things Star Wars. We have known Luke as a force for good, who never stops believing in the power of good. The dude didn’t even get a girlfriend because he was too busy saving the universe. The Last Jedi almost feels like a fan-fiction tale where Luke is now an angry, hermit man. Luke abandoned his family, friends, and the universe. This isn’t the Luke we know. His final battle with Kylo Ren ends up being both epic and then disappointing when he survives all the attacks and we find out he isn’t actually there. The moment of hope we get for him and the film quickly ends when he dies right afterward and just vanishes into the sunset. For the second time – audiences are forced to watch an icon who survived an epic war in the original trilogy go down without any real struggle. It’s frankly insulting. It probably would have been better to never introduce those characters back if they were going to die in this kind of way. I’m sure the lead characters could have been developed without staining the legacy that brought them here. This brings us to Luke’s successor: Rey. The Force Awakens set the audience up to believe Rey has an epic life planned ahead. She went from wandering alone on Jakku to befriending Han Solo, Princess Leia, and even training with Luke Skywalker in one movie. Then The Last Jedi throws the entire thing out the window. Kylo tells Rey that she is a Nobody. Irrelevant. Running against pretty much everything that The Force Awakens and The Last Jedi has led us to believe. Is that inspiring? Not really. We’ve been following a nobody with a lightsaber who has no legacy and no real mission. She has received no real training. Her allies are pretty much decimated. Now what? The movie never tells us. Now to the numerous plot holes in The Last Jedi. There are many. Finn and Rose go on a pointless mission that leads nowhere and actually ends up making things worse for the Rebels. The relationship between the two feels forced and their journey hardly has anything to do with the rest of the movie. Poe Dameron only really brings value in the first few minutes of the movie. His intertwining storyline with Finn is uninspiring and his arguments with the Rebels are also boring. This movie may have had the least epic battles in space of any Stars Wars movie and that is disappointing. The final battle Poe was in was shockingly unexciting. If you compare this to Rogue One it is a world of difference. Luke Skywalker hardly trains Rey. The Force Awakens and The Last Jedi both emphasize this island that Luke lives on often and pan across the island regularly, but the events on the island are almost irrelevant. Rey hardly gets 3 lessons from Luke but nearly an hour there. She could have had her telepathic conversations with Kylo while actually doing something interesting somewhere else. At least she takes the Jedi books with her. The spaceship chase plot is as boring as it is ridiculous. It feels quite like a bad episode of television. The numerous explanations for why the storyline even exists are confusing as heck. The First Order can track ships in lightspeed? The Rebels have no fuel, but just enough to last almost the entire film? Leia has an escape plan – or does she? Poe is taking over the ship, but then isn’t? In the end none of it matters because pretty much the entire Rebel group is eliminated by the time they reach Crait. The entire space chase could have been 20 minutes instead of 2 hours and the scenes of Crait could have instead lead to an epic showdown with Snoke if this movie was edited correctly. The botched Snoke death is really interesting. Kylo Ren and Rey kill off Snoke and his guards without much adieu. This can work in storylines where the ascending villain is actually a big bad (see The Defenders with Elektra). However, Kylo Ren is still just as weak and bratty as before and we just spent time humanizing him – not making him sinister. It isn’t clear what would make him into a villain you fear. The reason villains normally develop over time is to create sense of urgency for the audience that a big challenge is ahead. Plot and pacing issues are spread throughout. These are things that you will notice more and more as you dissect this film. Episode IX could spend time fixing many of the issues that Episode VIII created. That would be less time to enjoy a juicy ending to this trilogy though that might not recover from this filler episode. Don’t get me wrong – this film is still watchable. The Last Jedi has great acting, cinematography, and a wonderful soundtrack. Unfortunately, this could have all been utilized better if the writing was better. It doesn’t make it great. I watched the prequels afterwards to see if the fan anger matched up, I still believe the prequels are inferior to The Last Jedi. Mainly because the acting and casting is so hilariously bad in the prequels. The Last Jedi is not cheesy or badly acted, it just suffers from what seems to be a complete shift in the force that wasn’t clearly or correctly presented to the audience. So – Does The Last Jedi take Star Wars to the next level of cinema? Not quite. My Aunt celebrated her 39th birthday dinner at Tommy Bahama in St. Armand’s Circle this past weekend. It’s been a few years since my last visit to Tommy Bahama and from what I could remember the buzz about it was the mixed beverages that my family adored. This time around no one was drinking, they saved that for later excursions in St. Armand’s Circle. The menu had a few options that caught my eye, but I was feeling a burger so I decided to order their Smokehouse Angus Burger ($13.50) with crab bisque ($6.50) as an appetizer. My Step-Dad ordered the same thing. I ordered mine medium and him well-done. I had a hunch this was going to be a problem, but hoped the waiter would make sure to get the right one out. The complimentary bread that came out first looked incredibly delicious at a glance. When you actually tear into it, it doesn’t have much flavor. The butter they serve with it is a cinnamon-flavored butter that is very sweet and turned off some of my fellow diners. I have no problem with sugar and found it satisfactory. The crab bisque was amazing. It didn’t last more than a few minutes before it disappeared off my bowl. I almost liked it better than lobster bisque (my favorite soup on Earth next to clam chowder from Fisherman’s Wharf in San Francisco). The portion pictured is their small portion. Certainly a generous helping for a small. My sister ordered the chicken lollipops for an appetizer which were great and tasted like BBQ ribs. When the main entrees came the waiter accidentally confused my burger and my Step-Dad’s burgers. If this would have been something more expensive (such as a steak) then I would have sent it back, but since it was just a burger we decided to proceed forth with our meal. The toppings on this burger were excellent, but were offset by the fact that my burger was well-done and burnt charcoal. In contrast, my Step-Dad learned burger meat served medium is the way to go. Dessert was an assortment of cakes my Aunt chose. A rich chocolate cake and a coconut concoction. Both were delicious and the chocolate was rich with a base of what tasted like brownies. The server was quick to get refills to the table and the wait for the meals wasn’t a problem. Overall, Tommy Bahama is a nice restaurant to have some seafood and American choices if you have the money to spend. The restaurant is filled with windows and certainly fits what I would imagine to be a Florida vibe. My personal favorite restaurant in St. Armand’s Circle is The Columbia (which we visited later for some sangria and drinks). I went to Soobak with some friends last month was impressed with how good the food there was. Arriving early (for friends who always arrive late), I decided to order a California Roll to start my meal and was surprised with the generous portions and fresh taste of the roll. 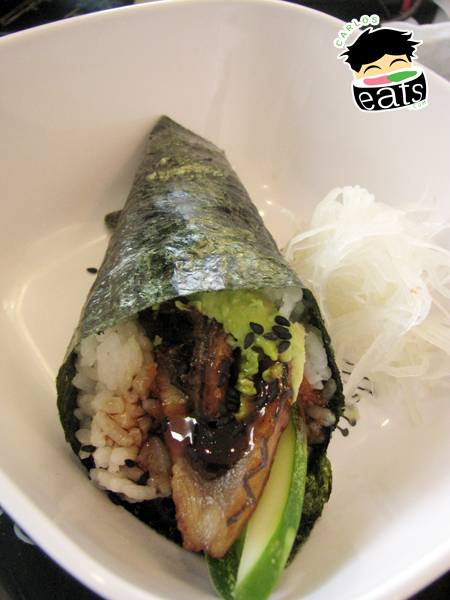 All the sushi rolls were delicious, including the eel handroll I tried. I am normally not a huge fan of complex rolls, but the Soobak Signature Roll, which features katsu lobster, salmon, krab delight, avocado, masago, tempura deep-fried with eel sauce, was delicious! Prices were extremely reasonable with their most expensive roll being under $10. The galbi bento box (pictured below) has plenty of rice and the ginger salad was excellent – trust me it will be hard to find LA galbi (the one you see in the USA) for less than $10 anywhere (even for lunch). The pieces of galbi were savory, sweet, bone-licking goodness. The miso soup that I added on was also worth the extra $1. One of the most interest parts of the meal was the Korean Taco with Bulgogi. It was absolutely amazing. $6.95 for two, but fully-loaded with plenty of ingredients inside – there is nothing like it in Tampa Bay. We sampled the frozen yogurt and it was surprisingly delicious (I’m not a huge fan of frozen yogurt because it normally hurts my sensitive teeth) – the taro was flavorful and went down easy. The place is small, but they have a big enough table for lunch with a few friends. Location-wise it’s close to Downtown and South Tampa – easily accessible from a bridge in the middle of the two. Parking is in the street – you might not be able to park in front, but there are plenty of public parking spots in the area. Overall, this place has plenty of different Asian dishes at affordable prices and with great tastes so I will be back for many more trips to this Asian spot on Davis Island. Make sure you sign up for a rewards card! Fun fact: Soobak means watermelon in Korean. Ploy Thai was one of the first Thai restaurants I fell in love with when I first moved to the Brandon area back in 2005. 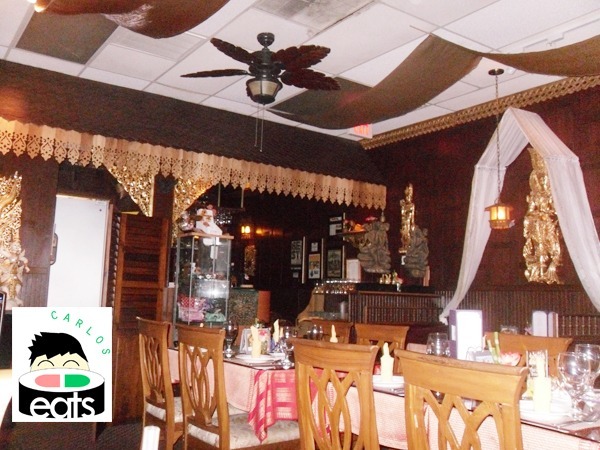 The inside is decorated as lavishly as any other Thai restaurant, but there is something about the quality of the food and service that I enjoy after every visit. The quiet atmosphere is relaxing and when I came back from a week-long trip of eating and traveling for spring break last year in San Francisco , the mecca of great food, the first place I wanted to go when I returned was Ploy Thai. My last visit was after finals. 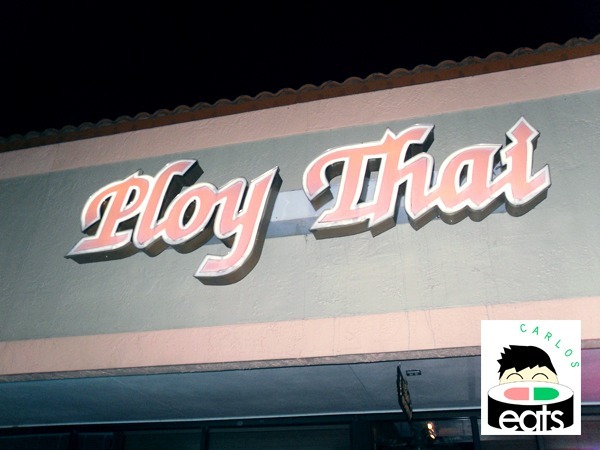 I was craving some Thai food after hours of studying and I thought of the relaxing environment of Ploy Thai almost instantly when I started thinking of restaurants in the Brandon area. Fun fact: Ploy Thai is named after the owner’s daughter, Ploy, which means “little gem” in Thai. I never intend to order soup, but I find it hard to resist once I look at an item on the menu and think about the last time I enjoyed one. 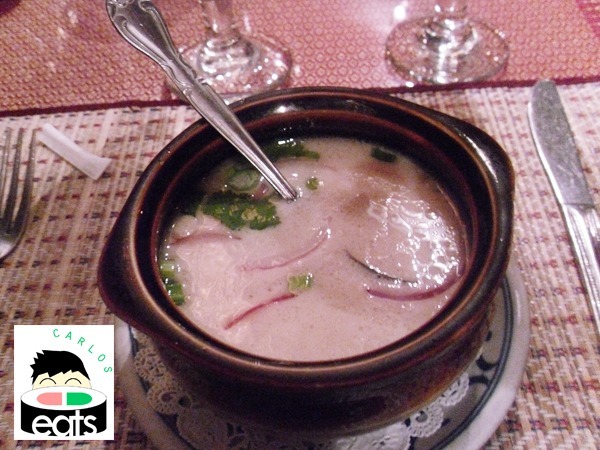 The Tom Kha Gai or Chicken in Cream of Coconut Soup ($3.50) started my dinner and I really love the lemongrass and cilantro in the soup and the coconut milk is sweet and leaves a nice aftertaste in your mouth. The Chicken Pad Thai ($10.95 for dinner) is superb. I personally enjoy my Thai food non-spicy and Ploy Thai consistently delivers an excellent Pad Thai in this regard, I can’t comment on Thai hot flavors. The noodles are packed with flavor and the smell of it fills me with zest. 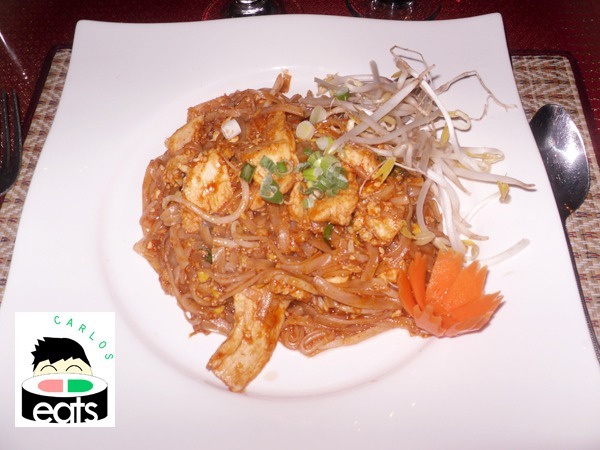 The quality of Ploy Thai’s chicken is great tender and juicy, and their simple Pad Thai really hits the spot. 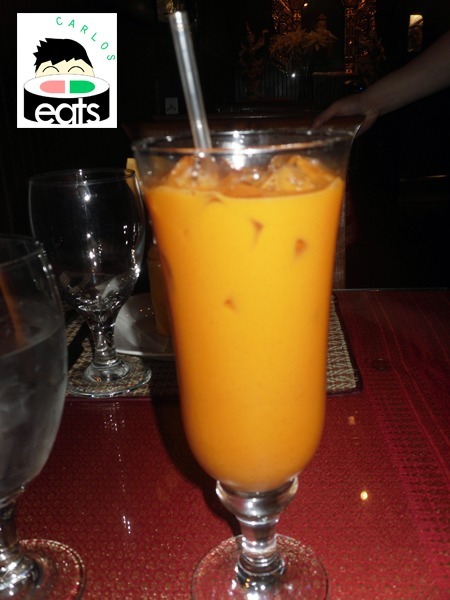 The consistency of the Thai Tea is usually made well and although you may want to ask for little ice so you can get more actual tea, the tea is usually reasonable for the price. Thai food is either water or tea, I find it hard to drink anything else with it. Overall, Ploy Thai consistently has great food and service and I have enjoyed every visit here in the past few years. They have lunch specials that are $7-$8 if you’re looking to save a few bucks. Ploy Thai is certainly worth a look if you’re in the Brandon area and is located only a few minutes from the Brandon Mall. I have been to the Cross Creek location in New Tampa and enjoyed it as well.